Microsoft has some great text selection tools. Double click and the full word is selected. Three clicks and a paragraph is selected. Click and drag and the selection automatically jumps in full word intervals. What many presentation designers do not have is the keyboard equivalents to these text selection options – they are amazing for speeding up design time! 1. 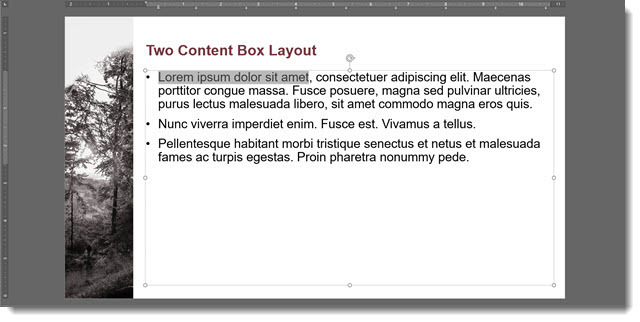 Select ALL text in a placeholder. 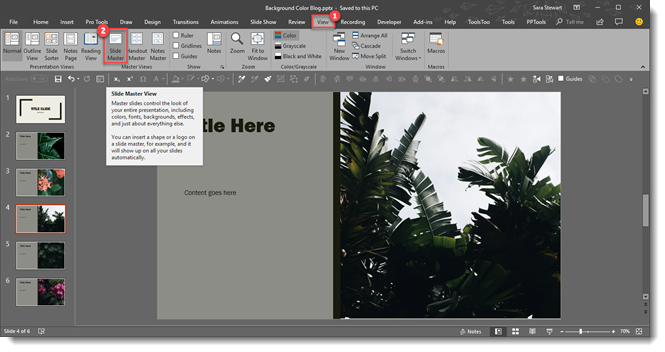 Click inside the text box, at the beginning of the paragraph, and CTRL + Shift + Down Arrow a full paragraph is highlighted. 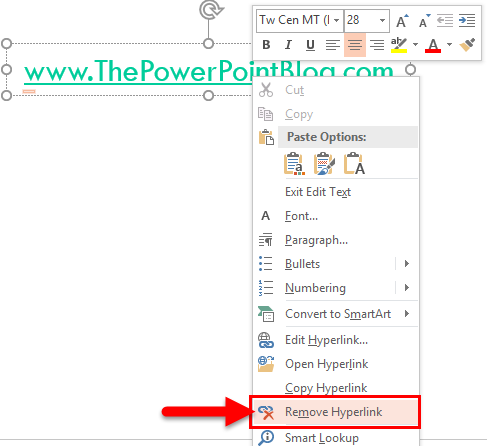 Click inside the text box, at the beginning of word to select, and CTRL + Shift + Right Arrow to select that word. Okay, now it’s time to go edit slides more efficiently! 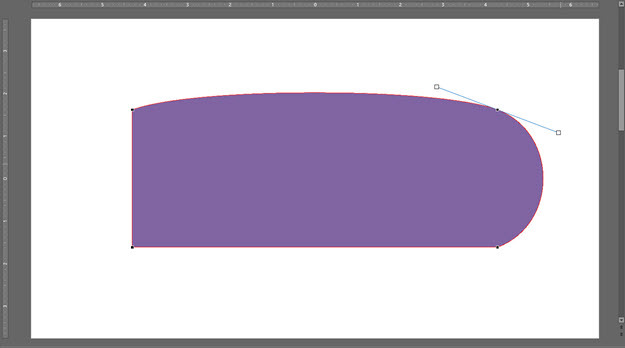 If you use Adobe Illustrator, or other vector art programs, you are familiar with Bezier curves. Vector art is scalable, without resolution loss, and is editable in both appearance and in shape. 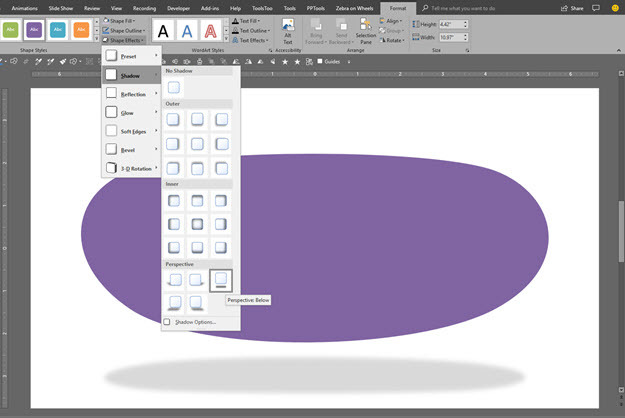 PowerPoint shapes are vector graphics and can be edited directly in PowerPoint just like editing vector art in Illustrator (but with a simplified set of options). 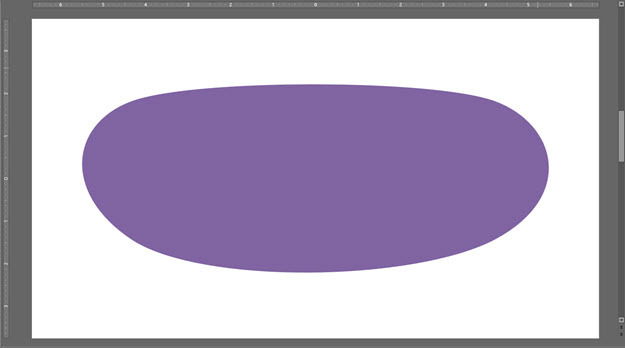 For example, Christie on the TLC Creative design team created this example showing how a rectangle can be edited into a purple jelly bean shape – all inside PowerPoint, using native PowerPoint features. 3. 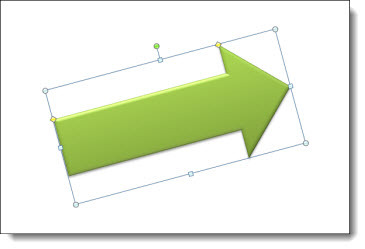 A rectangle is a simple vector shape with just 4 points, one for each corner. Click and select any of the points. The Bezier handles will display. 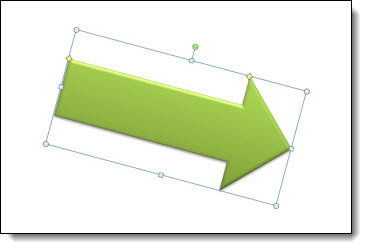 Right-click the selected point and from the pop up menu we can change the type of Bezier corner. 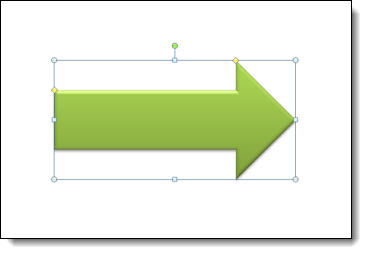 PowerPoint points can be SMOOTH, STRAIGHT, or CORNER points. For a rectangle, with all straight edges, the points are CORNER points which keeps the Bezier handles straight and 90 degrees to each other. 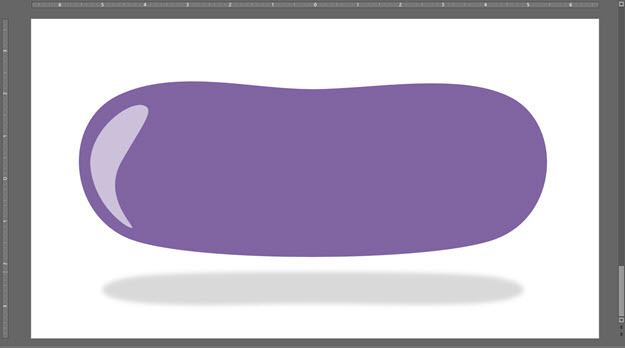 But to create my purple jelly bean I do not want the 90 degree corner and change its properties to SMOOTH. 4. The Bezier handles move outside the shape and it becomes a radius corner. 5. My purple jelly bean has no straight lines, so all 4 points are changed to SMOOTH points. The rectangle is now a “blob” with no straight edges. 6. 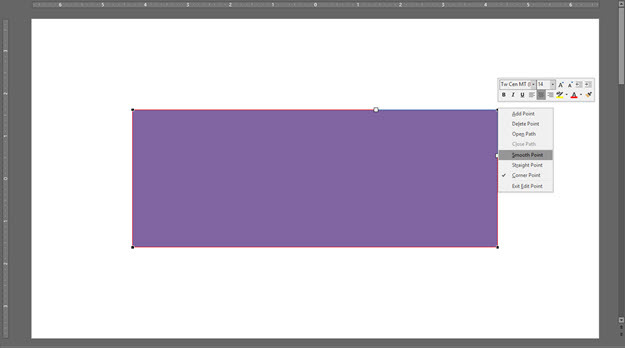 This next step has nothing to do with shape edit points, but I cannot leave a slide with an ugly shape, so I am adding a cast shadow. 7. 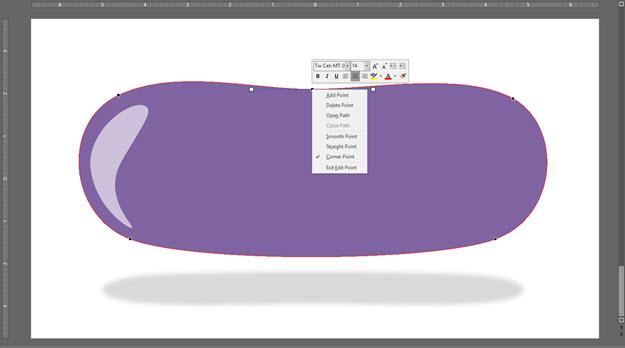 Back to editing shape points, and some design – duplicate the shape, change the color to a lighter shade of purple and then right-click and select EDIT POINTS. 8. Through a combination of adding a few new points (also SMOOTH points) and moving the position of points and Bezier handles, it was pretty quick and easy to create a new custom shape that is now a highlight accent. 9. 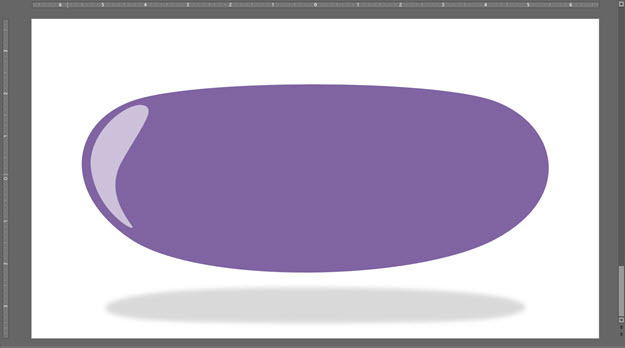 To make the large blob shape more like a jelly bean, right-click > edit points > add a new point in the top center (make it a SMOOTH point) and drag it down a bit. 10. Done – at least enough for this tutorial, and we never left PowerPoint. 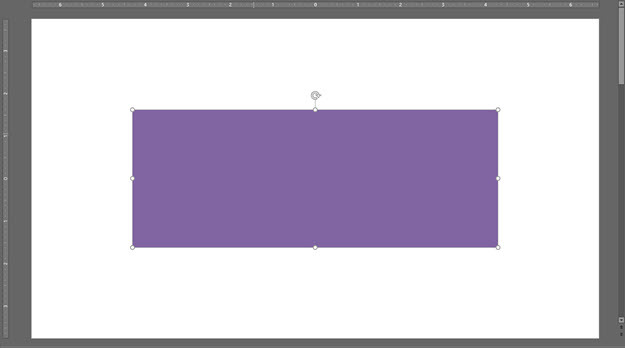 Think of it as working in a legacy version of Illustrator, maybe 2.0. 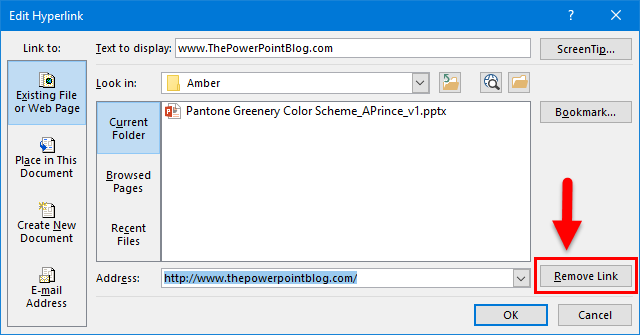 There are many ways to do the same task in PowerPoint, and all Microsoft Office applications. Rotating objects is one that many find difficult and tedious when using the rotate anchor. Using keyboard shortcuts to rotate an object (or several objects at the same time) is an amazing shortcut to know about! Use the keyboard to rotate the shape to the right with ALT + RIGHT ARROW. Hold the ALT key down and click the right arrow as many times as needed to get the rotation desired. 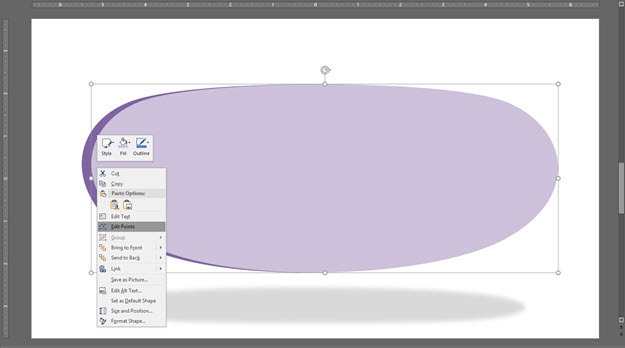 Under the Drawing Tools > Format Tab, click Edit Shape > Change Shape > Rounded Rectangle. 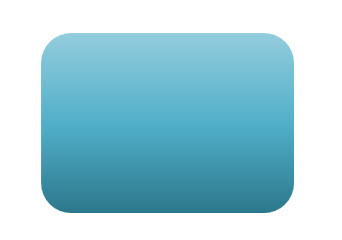 The rectangle will now be converted to a rounded rectangle. Done! Repeat to convert all the already formatted, positioned and animated rectangles throughout the presentation to the updated rounded rectangle styling in minutes. 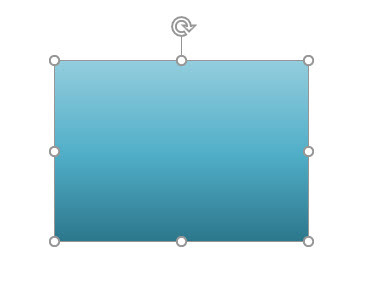 Or, leverage that wonderful custom gradient by morphing the rounded rectangle to an arrow, or any other shape in the Change Shape library. 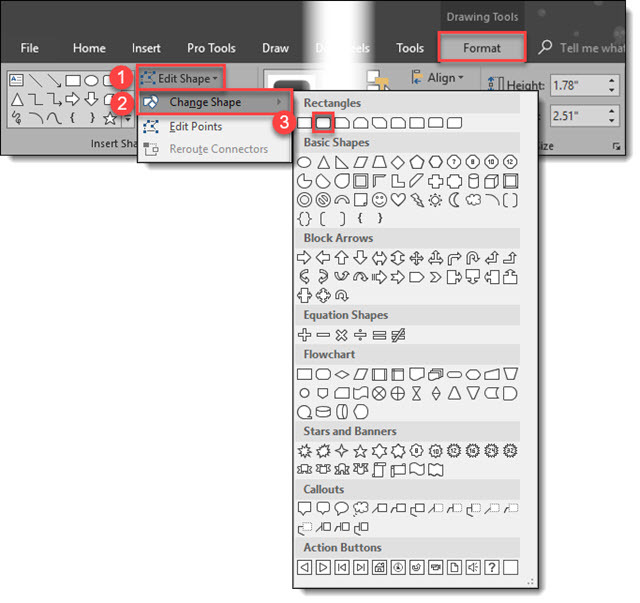 Tip: All TLC Creative design computers have the Change Shape drop down menu on our QAT for even quicker design and formatting. Note: this is a re-post, originally posted April 4, 2016. When planning the posts for this month it made sense to include this tutorial again. Printing slides is a common need. But the Microsoft presets are not optimal. 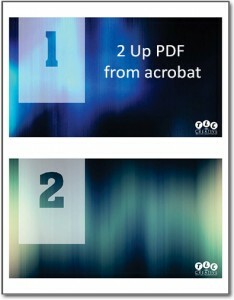 For example, let’s look at “2-up” printouts directly from PowerPoint and then we’ll look at my preferred option which is using Adobe Acrobat to create the 2-up PDF printout. 2. In the PUBLISH OPTIONS section, change the drop down menu to HANDOUTS. 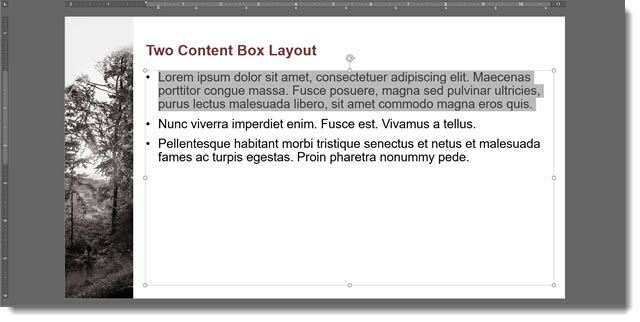 Slides per page = 2. Keep HORIZONTAL setting. A print preview of the pages will be on the right. Select OK and your PDF will be created. 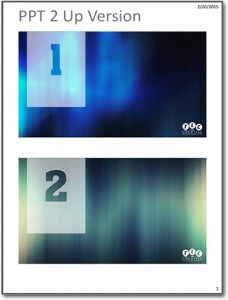 But, these can be larger images of each slide if we do not use the PowerPoint preset. 1. 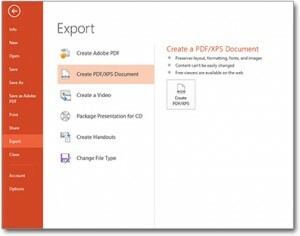 Go to File > Export > Create PDF/XPS Document. 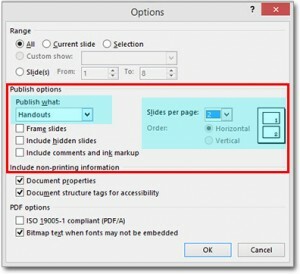 This time don’t worry about the options, just create PDF with 1 slide per page (the default print setup). 3. 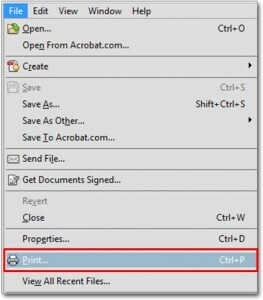 Select ADOBE PDF as your printer. 4. In the Page Sizing and Handling select MULTIPLE. 5. 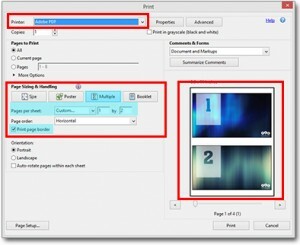 In Pages Per Sheet select Custom. 6. Set to 1 by 2, the small print preview should look like the below example. 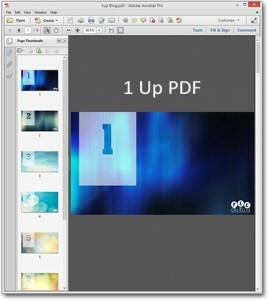 As you can see, side-by-side, the Adobe Acrobat 2-up PDF printout on the left has larger slide images than the PowerPoint 2-up printout, the Adobe Acrobat 2-up takes up the page significantly more than PowerPoint does. Just a simple option to provide better printouts. 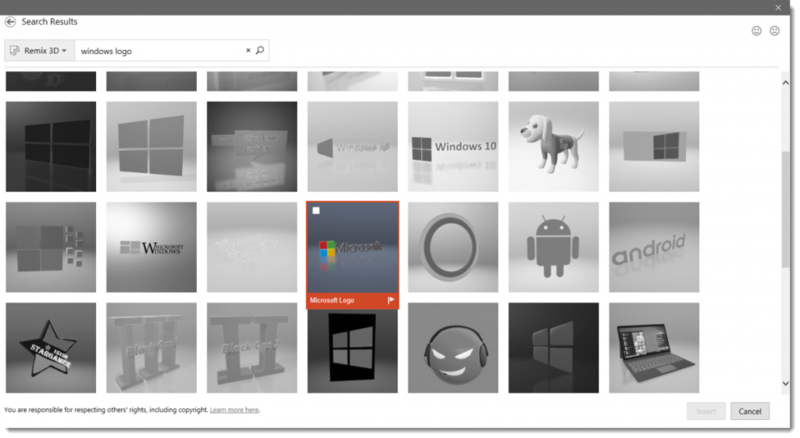 There are 5 new animations in PowerPoint! All 5 are for 3D models only, and they provide on-slide animations (vs. using Morph to animate and see different views of a 3D model). 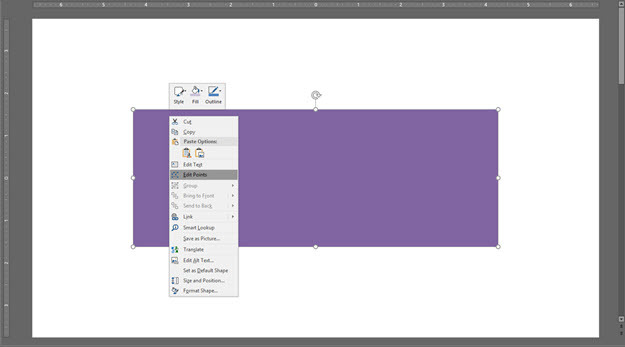 I am hopeful that we will see additional new animations as support for 3D models continues to evolve in PowerPoint. The new animations are found on the Animation tab. 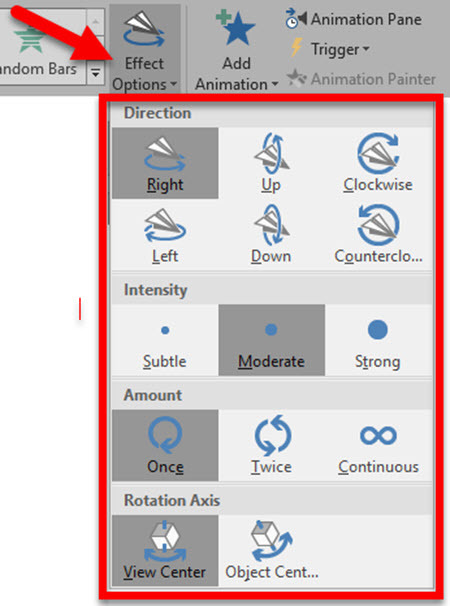 Each animation has a number of Effect Options to adjust the animation action. One option is the click the Effect Options drop-down from the Animation Tab. 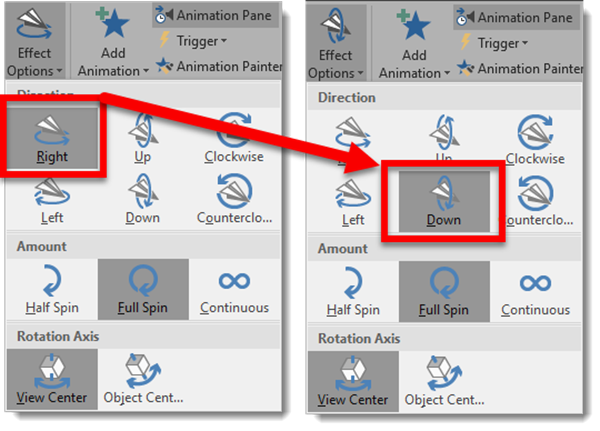 The other option is to view the Animation Pane and right-click the 3D model animation and select Effect Options to open the animation dialog. And here are the 5 new 3D Model animations! My personal hope is that the use of these animations will extend to be able to apply them to anything; photo, shape, text, icons, etc. But for now I am excited to finally see something new happening on the Animation tab! Combining the Morph transition with 3D models is easy, and can create amazing visuals and motion animation! Insert a 3D model on a slide. Position and rotate. Then duplicate the 3D model to the next slide, adjust position, size and rotation with a morph transition. Watch the results! 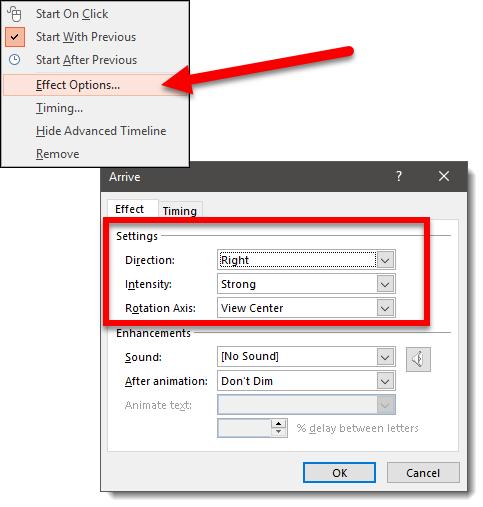 Make it a slow and long animation with a slow morph transition! We can use the Pan and Zoom as part of our morph animation! TIP: 3D models can have any standard animation applied (motion paths, grow/shrink, fade in/out, etc.). IF it has an emphasis animation, the morph transition will continue to work. If it has an entrance or exit animation, the morph transition will apply to that model because it cannot have 2 entrance or exit effects (eg. morph entrance and fade in animation entrance).